As Kay Baker prepares to host the The Picayune and KBEY 103.9 FM Radio Picayune Toy Drive, she personally reflected on the importance of the organizations whose volunteers work tirelessly around the year to ensure every child in the Highland Lakes wakes up Christmas morning with presents under the tree. She and her family signed up for help through Highland Lakes Christmas is for Kids, a local nonprofit that raises money and buys toys throughout the year to give to children in need on Christmas. Baker filled out the paperwork, which included her son’s clothing sizes and the things he wanted for Christmas. Then, the volunteers took the list, along with hundreds of others, and made those young people’s Christmas dreams come true. It’s one reason Baker loves the annual The Picayune and KBEY 103.9 FM Radio Picayune Toy Drive, which is 6 a.m.-3 p.m. Wednesday, Dec. 5. The toy drive benefits Highland Lakes Christmas is for Kids, Burnet County Santa’s Helpers, and Granite Shoals Christmas Outreach. 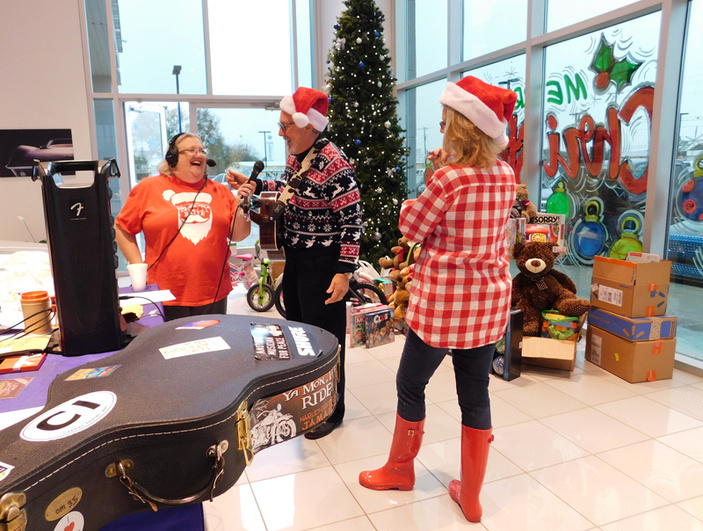 Baker and her “Wake Up Call” co-host, Ed Chandler, will be broadcasting live from Chevrolet Buick of Marble Falls, 2301 U.S. 281, while the always upbeat Ben Shields will be at the Burnet Fire Department, 2002 S. Water St. (U.S. 281) accepting toys and monetary donations. Baker said they’re working on a lineup of musical guests and others to help make it a festive event. You can also drop off toys and donations at the Granite Shoals Fire Department, 8410 RR 1431, and the Marble Falls VFW Post No. 10376, 1001 Veterans Way. When her family was struggling, and she worried about buying Christmas presents for her son, Baker found a bright spot in the grace and love of the Highland Lakes Christmas is for Kids volunteers. The presents even came wrapped, which really helped come Christmas morning, when her son jumped out of bed and raced to the waiting presents. The wrapping paper was unlike any in the house. “So he knew then, since the paper the presents were wrapped in wasn’t like anything we had, these gifts must be from Santa,” Baker said. And, if you think about it, she added, they were. He just used a lot of Highland Lakes elves to make it happen. If you want to drop off toys or donations prior to the day of the drive, you can do so at Galloway Insurance, 100 Avenue H, Suite 101, in Marble Falls; KoKo FitClub, 1400 RR 1431, Suite 120, in Marble Falls; McDonald’s of Marble Falls, 1605 RR 1431; Madlyn’s, 2106 U.S. 281 in Marble Falls; Bulldog Bodywerks, 1304 Buchanan Drive in Burnet; and Granite Mesa Health Center, 1404 Max Copeland Drive in Marble Falls. Or, just bring them to The Picayune and KBEY office at 1007 Avenue K in Marble Falls during regular business hours. You don’t need to make a big donation. Give what you can because it all adds up.